The year is 1982 Ronald Reagan is in office, Michael Jackson releases ‘Thriller’, ET- The Extra Terrestrial comes out, the San Francisco Forty-Niners win the Superbowl and the New York Islanders win their second consecutive Stanley Cup. We also have a shifting of the guard in the AMA motocross series as some kids start to take the next step up. Second year pro Rick Johnson burst on the scene by winning the first national of the year and was a broken front wheel away from winning the 250 national title. The gauntlet is thrown down at the opening round of the 125/250 nationals at Hangtown when Yamaha’s pro support rider Rick Johnson comes out and shocks the vets by winning the 250 race. The second year pro wasn’t even on a works bike, he was on a modified production bike and it dropped a bomb in the class. In the first of a couple of curious moves, Yamaha puts 1981 500cc champion Broc Glover in the 250 class outdoors and by the end of the season, it’s a dogfight between Glover, his young upstart teammate Johnson and Honda’s Donnie Hansen. Those three fought tooth and nail all season and Johnson was actually in position to win the title at the last round in Castle Rock, Colorado (not far from the current Lakewood national) when he broke a front wheel on his Bob Oliver-tuned YZ250. It was a heartbreak for the El Cajon kid and it would be a couple more years before RJ would end up winning a title. 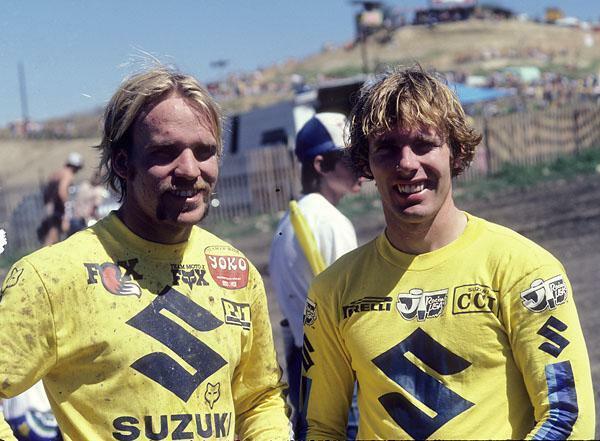 Kent Howerton (right) and Mark Barnett formed a powerful duo for Team Suzuki in the early 80's. 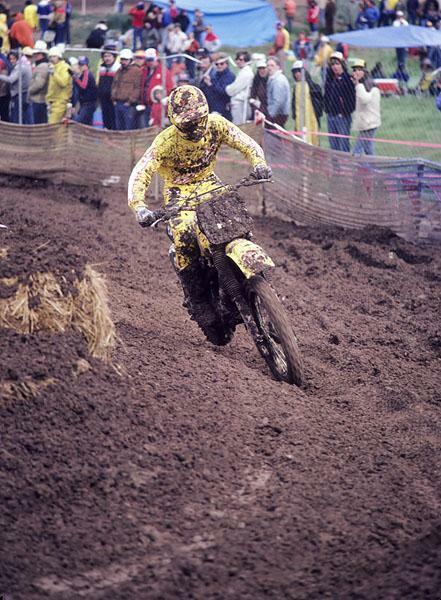 Instead, Hansen won the 250 National crown to go with his AMA Supercross Championship. 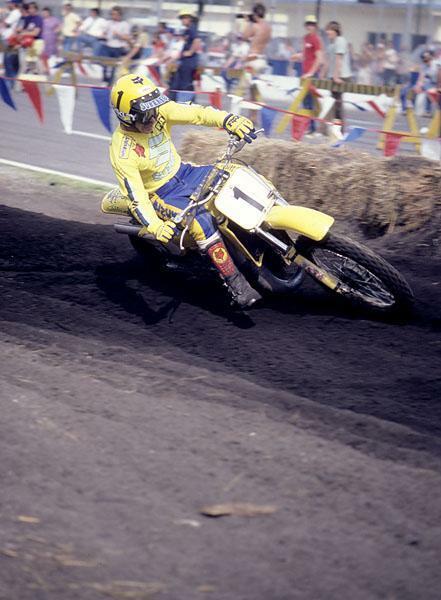 Hansen had not won a single AMA National or Supercross main event before his miraculous 1982 season, so he was on the rise. He was also set to once again participate on Team USA at the Trophee and Motocross des Nations in Europe, and he even went over a couple of weeks early to compete in the last round of the 250cc world championships, sweeping both motos of the last round in Sweden. But then Hansen was practicing in West Germany at Rolf Deiffenbach's house and crashed hard. He hit his head and caused such trauma that he not only pulled out of the MXoN and Trophee events, he could not get back on the bike and properly defend his titles in 1983. The crash in West Germany effectively ended the American hero's career as a professional. But he continues to ride and teach in his Donnie Hansen Training Academy, and his son of course is Josh Hansen, who is vying for the West Region Lites SX title right now on his Monster Energy/Pro Circuit Kawasaki. Hansen’s double-title run coincided with a revamped Team Honda effort in the U.S. Suzuki and Yamaha had been gobbling up most of the championships in the late 1970s and early 1980s (must be something about yellow bikes), but Honda had hired the services of five-time World Champion Roger DeCoster and brought his young American mechanic Dave Arnold back home to run the U.S. race team. Hansen’s titles would become the first of many for the rapidly improving Honda squad that would soon dominate every class of U.S. motocross racing. Mark "The Bomber" Barnett would win his third consecutive 125 outdoor title in 1982 and just miss out on the supercross championship as well. In the 125 class, the two-time defending champion Mark Barnett became the three-time champion as he won once again captured the AMA 125 National Championship. It was a little different from his other titles as the kids Johnny O’Mara and Jeff Ward were getting better and better. The Suzuki works bike was also not improving at the same rate as the Hondas and Kawasakis, but Barnett’s grit and strength helped him outlast the younger competition. It was a good season for Barnett, as he also just narrowly missed defending his supercross title from 1981. The Bomber would find himself in four-way a battle in the 1983 season as he tried to become the first ever four-time 125 national champion. Kawasaki’s Jeff Ward won a couple of nationals in 1982 and was beginning to get some confidence. Would he be able to take that next step? Despite coming off an injury and reclaiming himself back among the elite in the 250 class, Yamaha shifts Bob Hannah to the 125 class, and he voices his displeasure with the quality of his 125. The Hurricane’s works YZ couldn’t match up to the offerings from the other OEMs and Bob struggles his way through the season to a seventh place in the standings. Four years away from the class and a bike that he wasn’t happy with was not a good combination for Bob and it would turn out to be his last year with the OEM. Bob "Hurricane" Hannah did not enjoy a stellar 1982 season as he struggled in the 125 class. Storm warnings were called off until 1983! In the 500 class, with defending champion Glover gone, Honda’s Darrell Schultz won his first and only national championship in a fight with the 1980 champion Chuck Sun. The two Honda riders would go down to the wire and you can hear Schultz’s take on it right here. And 1982 was also the first year of the Loretta Lynn's AMA Amateur National Motocross Championship, which was founded by MX Sports -- the company that organizes the whole Lucas Oil AMA Motocross Championship, along with their commercial partners Alli Sports. The power shift from Europe to America continued with not one but two Americans winning world titles in 1982, as '72 AMA Motocross Champion Brad Lackey finally realized his decade-long crusade to win a 500cc world title, then watched Danny LaPorte also win a title two weeks later in the 250cc class over Belgium’s Georges Jobe. It was the Yamaha mounted LaPorte’s first year over there. In contrast, Lackey’s life-quest was over and he wasn’t able to find a ride to his liking to defend his title and he would ride off into the sunset with the title. After shocking the world in 1981, Danny "Magoo" Chandler and Team USA would absolutely dominate the 1982 Motocross and Trophee des Nations. Chandler went 1-1 on the 250cc machine and then followed that up with another 1-1 a week later on the 500’s. It was truly one of the best rides in the history of the sport, as Magoo won all four motos, the one and only time that has happened in that events long history. With the MXDN wins and two out three World titles in American hands, the tide was turning in America’s favor after years of getting beat soundly by the European riders.